Click on picture for more details. Custom Northwing Maverick trike. 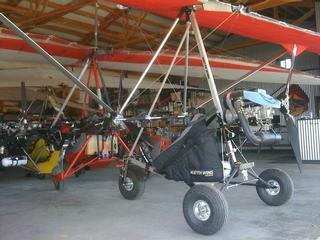 Off-field landing and XC capability is not easy to find in ultralight trikes but this one was modified to address those demands. Only one owner. Purchased new about 2.5 years ago by doctor & kept in hangar. Has only 28 hours total time but monthly engine run-ups for 15 - 20 minutes even if the plane was not flown. Rotax 503 SCDI with Electric start AND pull start. Tundra tires. Apache (heavy duty) front fork assy with hydraulic braking. More braking could be added to the rear if desired for extremely short runways. XC-type Pacer wing with STOL performance. Currently tuned fast but could be re-tuned for beginner. Nice little plane that is ready to go play in the sky without all the Sport Pilot blah blah... Simple wing to setup & take down for transport - and only weighs about 115lbs. Lynx helmet, headset, radio interface, press-to-talk & GPS can be negotiated into/out-of the deal. Delivery & demo is an option depending on your needs. Currently located in WA but can be delivered anywhere for about $800. Fairing & dash available from manufacturer.